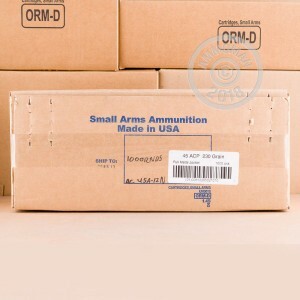 If you shoot a lot of .45 ACP, grab a few boxes of this ammunition from Armscor. 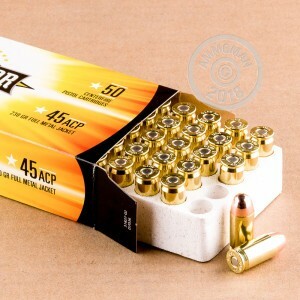 Each cartridge in this 50-round box fires a heavy 230 grain full metal jacket bullet at 830 feet per second. This is a standard pressure load similar to the original mil-spec one, and it works well in the vast majority of .45 Auto handguns including popular concealed carry pistols and 1911s. 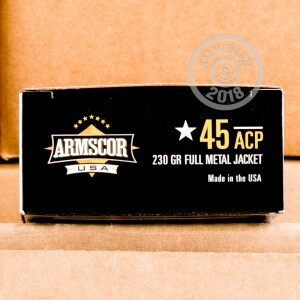 This ammunition is made by Armscor USA using non-corrosive primers and reloadable brass. Armscor has been offering their products in the American market since 1985 and their products offer shooters affordable quality.